Starting off with my olive green jacket it is from Marks and Spencer, this exact one is a gift from my aunt this year's march so there is a big chance that they discontinued it. This jacket is one of my favourites, I love the collar and how it sits when it's buttons in my opinion it adds a classy element to the whole look, not forgetting to mention the subtle quilting along the sleeves. Another cool feature about this jacket is that it can be shortened, there is an access rubber-band in the back of the jacker that can be pulled and tucked in to shortened the jacket, Plus nothing more screams christmas than olive green. My top is from Forever 21 and I personally think that there is an extra christmas vibe in the top just because the red and greens in the flowers. My top is obviously the week part of this whole outfit because the material is thin and is not completely wearable in this kind of cold weather but then again it's how smart you play around with items like this to be wearable. 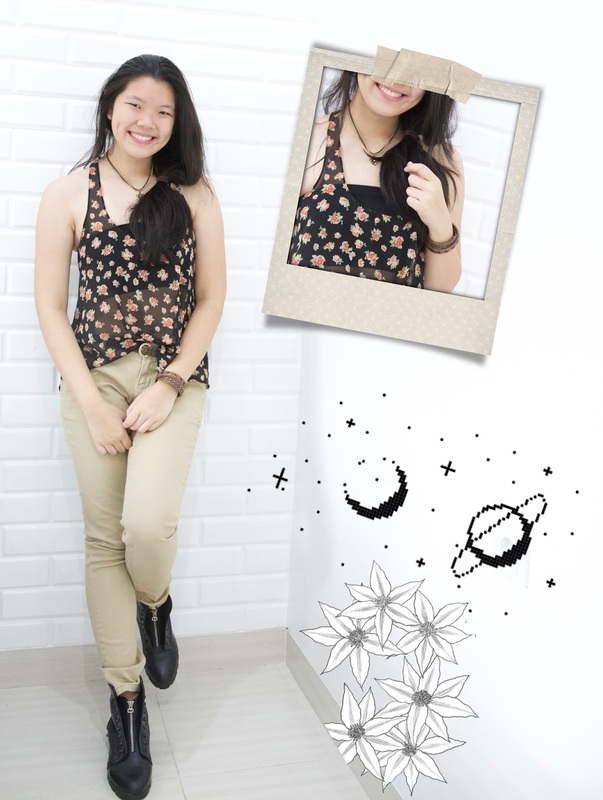 This top is pretty explanatory based on the picture, it is a low scoped sleeveless top with rd roses and green leaves all over the top. My trousers are from Massimo, it is a beige almost cream coloured or some may call it the skin coloured trousers. This pair is fits pretty nicely and I would have gotten them in a size smaller because as you can see it does not fit the best and is a bit looser in the waist. Lately I've been getting around 10 emails from you asking how to style a skin coloured pants or is skin coloured pants a "no no" and I figure I would just answer it here. 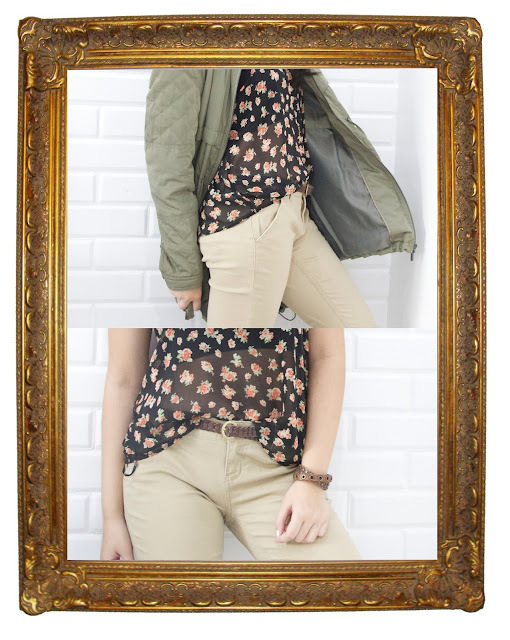 And the answer is a skin coloured pants is actually a flattering piece to own IF styled properly, the key to balance the whole look. Since a skin coloured trousers are pretty light you might want to try a darker to, and to give an appearance of an existing pants a crop of or your top tucked in and synced with a belt will do too. Take note that this kind of pants look amazing with colours that are cooler and darker, stay away from warmer tones like red, orange and brown. Now this tip will not work for all light coloured pants so don't be afraid to experiment. 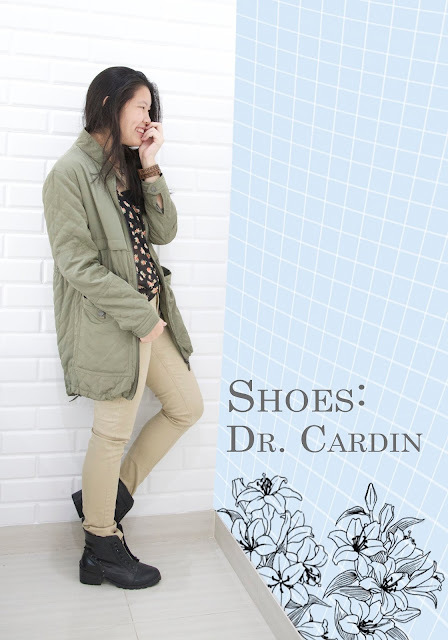 My shoes are from Dr. Cardin and I am obsessed with this pair, I've got this pair for quite awhile now and It must have been one of my most used shoes yet. I've got to justify it that since it's black it does match with everything which is why I use it ever so often. My belt is from fossil, and it is actually my mom's so I don't know it's history but all i can tell is that it's not the most conventional belt in the world because it does not have the fabric thingy that keeps your extra access belt to flap over. To complete this whole look I claps on a necklace from one of my bestfriend Indira that she gave me at fourth grade, a little back story it's actually a friendship necklace between 3 of my other friends and I but you know how life goes you'll grow apart sooner or later so I just like to have a piece of memory stuck in my neck which sounds a bit creepy. Don't worry nothing bad happen we just got older, but me and Indira are still pretty close so no harm done. Then the very last accessory I have on is a leather wrap bracelet with bronze stud detailed embroidered around it. And that is it you guys! Thank you for sticking thorough until the very end I'd appreciate it tons. Happy holidays and I'll write to you soon!